Home Expert Advice Skincare Advice Acne & Breakouts Does Zinc Help With Acne? When it comes to acne, the trace mineral zinc has an interesting track record that makes it worth considering. 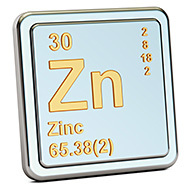 This connection was first made in the late 1970s, when researchers noted in an acne zinc study that participants with acne tended to have low levels of zinc in their bodily fluids (bodily fluids other than blood, as blood tests alone aren’t helpful for determining zinc levels), while participants with minimal to no acne had normal levels of zinc. It turned out that taking zinc supplements led to a visible improvement in acne for many of the zinc-deficient people, establishing zinc’s role as a potential acne-fighter. How great is that?! But how does it work? How much zinc do you need, and is it safe? Can controlling acne be as easy as taking a zinc supplement, or do you need a zinc cream for acne, too? The answer is a bit complicated, as truth in beauty often is, so bear with us: The research isn’t as conclusive as it might seem. How Much Zinc Should You Take for Acne? Here’s where things get complicated: We know for sure that oral zinc supplements tend to work better than topical skincare products that contain zinc, in any form (cream, liquid, or gel) or any concentration. There’s also disagreement when it comes to zinc supplements regarding which form is best and how much someone with acne should consume for visible results. For zinc to work, it must be “bioavailable” so your body can use it. Among the types of zinc supplements typically discussed, zinc orotate, zinc methionine, and zinc acetate are generally the preferred versions. On the other side of the debate, zinc gluconate and zinc sulfate have contradictory research; some studies show zero improvement in acne, while others resulted in noticeable improvement. Keep in mind that despite this positive, yet complicated, research about zinc supplements for acne, not everyone who breaks out will respond favorably. No matter which zinc supplement for acne you’re considering, be sure to consult your healthcare provider beforehand. Only a small amount of zinc is needed; taking amounts greater than 30mg per day can lead to side effects like an upset stomach and nausea. Just as with oral zinc supplements, there is disagreement on what type of zinc works best for skin. Research has shown that applying various forms of zinc to skin tends to work only when coupled with topical antibiotics prescribed for acne. There are studies showing that topical zinc applied alone does little to nothing for acne, but when combined with an antibiotic, the results are better than applying the antibiotic alone. Interestingly, comparative studies have consistently shown that benzoyl peroxide improves all aspects of acne better than zinc combined with a topical antibiotic. This brings us back to the basics of acne management, making the zinc topic somewhat moot. Exactly how zinc works when applied to skin isn’t fully understood. What’s thought to be happening is that forms of zinc, such as zinc sulfate or zinc acetate, inhibit certain enzymes and “rogue” fatty acids in skin that fuel the growth of the bacteria that trigger acne. Zinc also seems to have a balancing effect on skin’s microbiome, helping to keep the mix of good and bad microbes in harmony. It’s also been theorized that zinc reduces signs of acne because of its potent antioxidant and calming ability on skin. Acne is an inflammatory disorder, so anything you can apply to minimize inflammation is a good thing. At the very least, topical zinc might minimize acne-related redness. Last, both topically and internally, zinc seems to also play a role in controlling oil production, possibly because it lowers the amount of the male hormones (androgens) that play a pivotal role in acne and oily skin. Your diet may already be providing enough zinc, so take that into consideration if you’re considering a zinc supplement. Generally, meat-eaters tend to get plenty of zinc, while vegetarians and vegans get much less. The reason? Those who don’t eat meat or animal foods tend to consume more beans and whole grains. Both are great, but they contain ingredients called phytates, which bind with minerals, including zinc, during digestion, causing it to be eliminated from the body before it can do much good. Zinc oxide (the kind of zinc found in diaper rash creams and sunscreens) is sometimes touted as being a good type of zinc to apply to acne-prone skin. But there’s simply no research proving its worth for acne. If anything, zinc oxide’s natural consistency and opacity make it a potential pore-clogging ingredient; however, whether it will have this effect depends on how the zinc oxide is formulated. For example, the types of zinc oxide used in sunscreens are typically “wrapped” in other ingredients that improve application and keep the zinc oxide on skin’s surface to protect it from harmful sources of light. In this situation it can’t get inside the pores where clogs start, which makes modern-day sunscreens with zinc oxide a good choice even if you have breakout-prone skin.